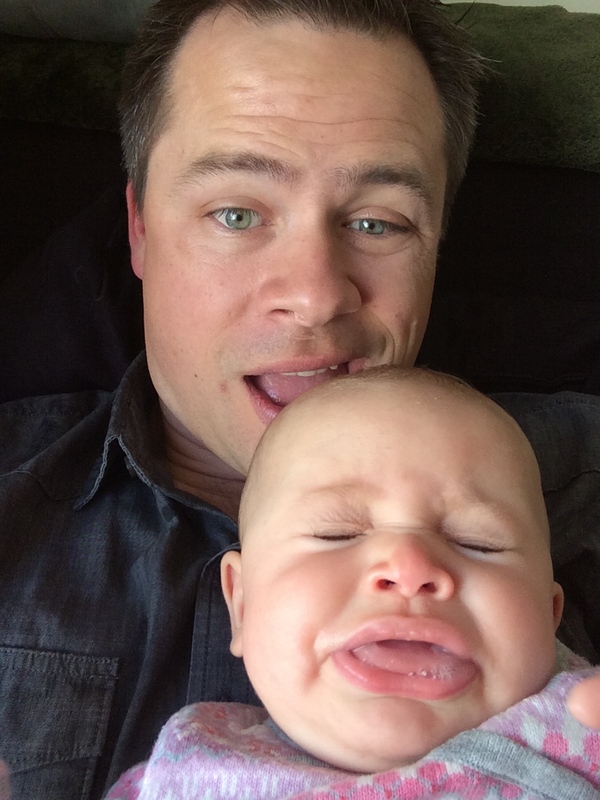 …well here’s how I jump back into it; I’ll try to sum up our last 4+ months if I can. Last flight… next stop, Sweden. 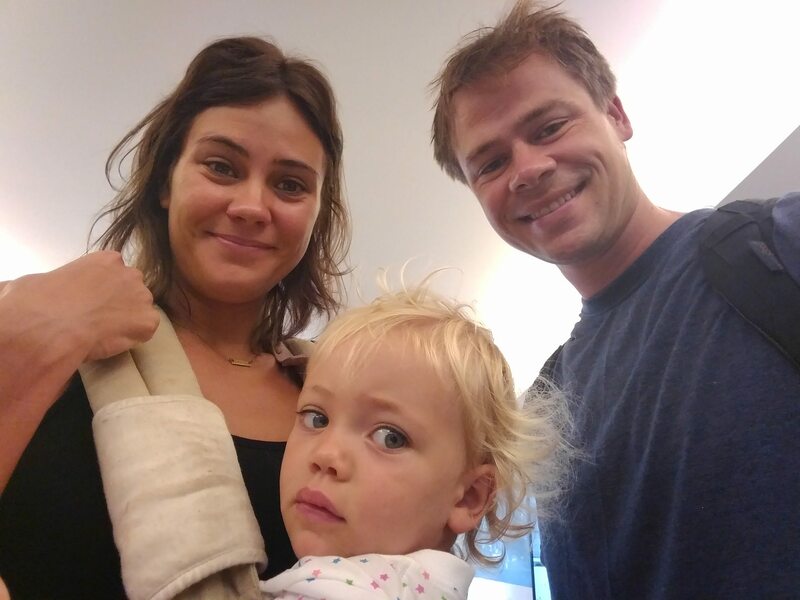 After nearly 6 months of traveling, we landed in Stockholm on June 13th, in the midst of Swedish summer (imagine a Berkeley spring). We were pleasantly surprised with our new apartment. We are renting an apartment from Jannika’s cousin, which is actually the bottom half of their house. We had not seen any pictures of the place beforehand, but we needed landing pad and we figured this was a great place to start out, and it was close to family. Just a 10 second walk (or knock on the ceiling) from Jannika’s cousin and family, and just a 5 min drive from Jannika’s sister and family. We are thrilled! It is a big one bedroom place with a big back yard and garden. The garden has an apple trees (I made 2 rounds of hard apple cider in August), a plum tree and wild strawberries and rhubarb growing in the corners. 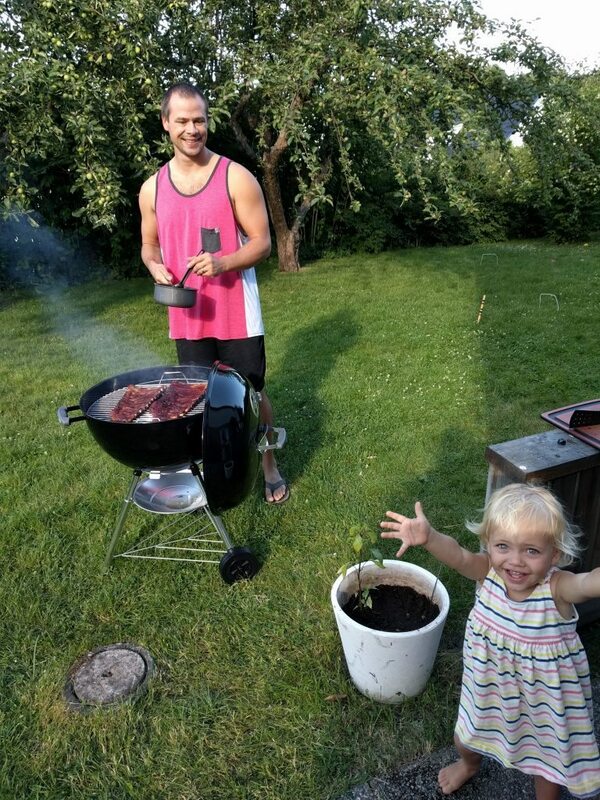 BBQing ribs in the back yard this summer. Those first couple of weeks were hectic. We moved in to our new place, started unpacking our boxes (which were cremated from the moving), checked in with the authorities (immigration, social securities, daycare, banks…). AND, Jannika started a summer job. So after 5.5 months of traveling we were thrown into ‘real life’ again. On top of that we forgot to bring the pickled herring to the Midsummer Party (no joke, true story). It was basically like forgetting to bring the holy grail to the Last Supper… After some grumble and cussing under his breath, my brother-in-law went to the store to pick up some fish in a jar. I am really glad we brought him a nice gift from Thailand to balance out our grave mistake. We got past it. Everything is better now. While Jannika was working her summer job at the Swedish version Les Schwab or Big-O-Tires (friend-of-a-friend situation), Freya and I spent our days learning about the frownie-faced culture in which we were now living… super nice and polite culture, just not big on smiling in public. I quickly learned that automatic doors do not open until your face is JUUUUUUUST about to slam into them (due to the cold temperatures during most of the year, I’m guessing). I also learned that nearly every store, including the grocery stores, has a New York Yankees section. Seriously. Swedes love than ‘NY’ logo. They have no idea it’s a baseball team. I actually saw a guy at the Stockholm Beer and Whiskey festival wearing a New York Mets t-shirt, a New York Yankees jacket, and… wait for it… a Boston Red Sox hat!!! I don’t think he was a die-hard fan of all three. 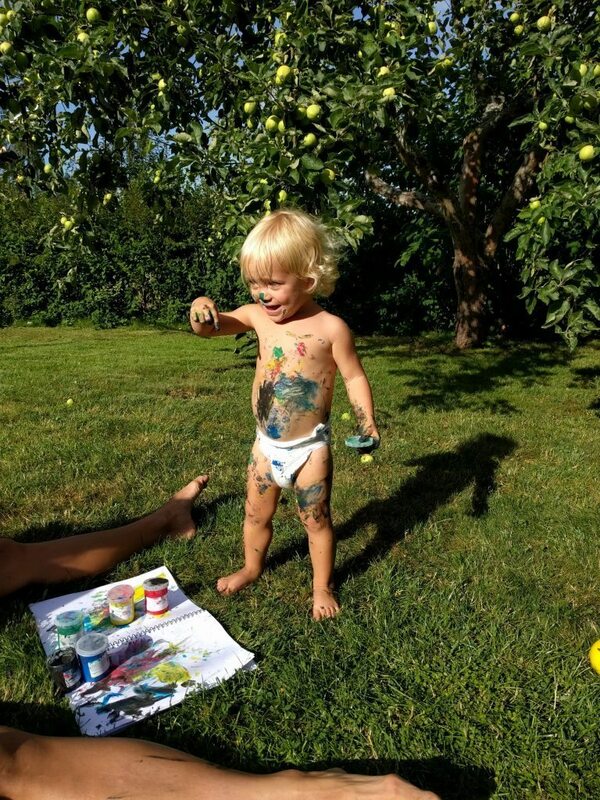 Freya painting in the back yard. Anyway, we’re all settling in now. 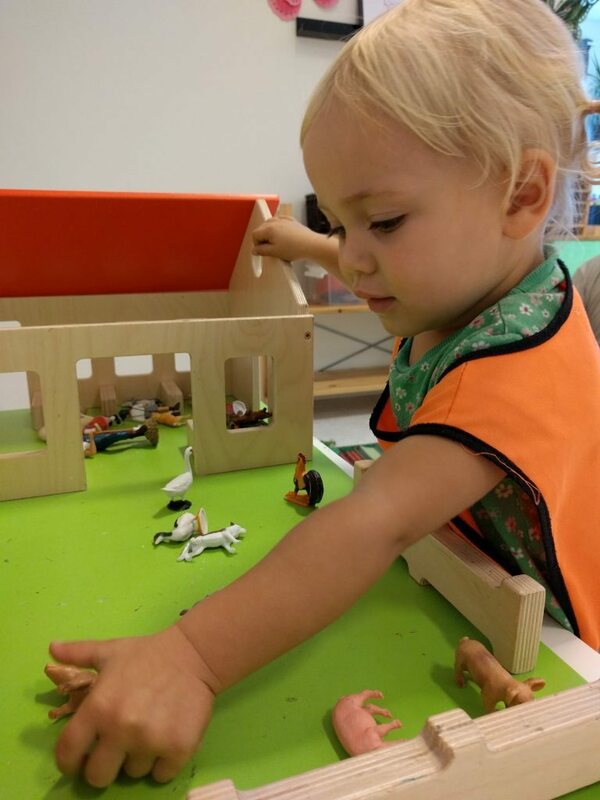 Freya is loving school and enjoys spending time with her cousins. Jannika’s cousin Charlie and his fiancé have a little girl, Iris, that is 8 months older than Freya and they absolutely adore each other. 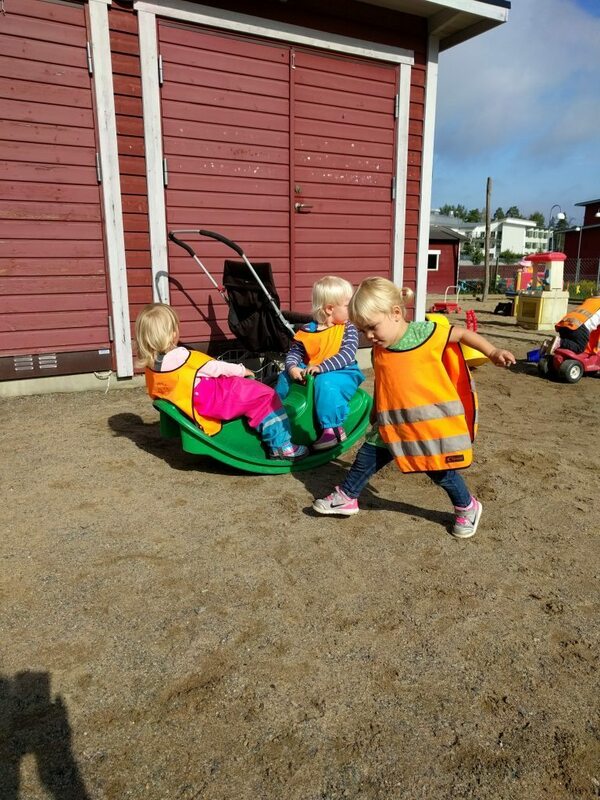 They always hug when they see each other, and having Iris at the same preschool really helped Freya feel safe with the new environment. Freya is already speaking more Swedish than English. It’s incredible how fast children learn languages. Jannika barely spoke Swedish to her before our move here, but now that she is immersed in it she already speaks more Swedish. Freya’s first day of school. She’s dancing around. 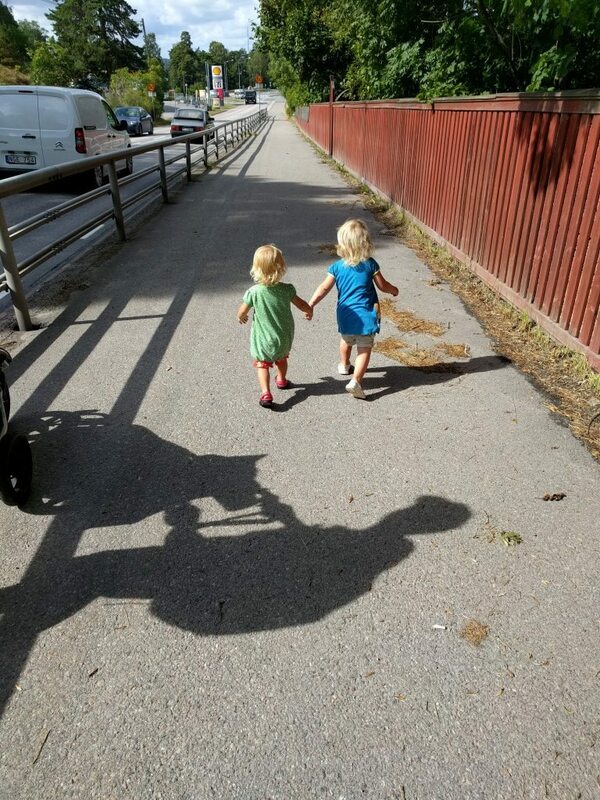 Freya and her cousin Iris holding hands on the way to the beach. There’s so much more to write about, but I’ll end this post here. I’d love to go back and write about the rest of our travels… Vietnam was amazing. As the weather here keeps us inside more and more, I’ll start writing more regularly. Cheers to all. Hopefully our paths will cross soon! So happy you all are getting settled. Enjoy it all! Lots of love to you all as Thanksgiving and Christmas get closer. Thank you Kacey. I hope you and the family are doing well. Always enjoy reading about ur latest life adventures – wishing u, Jannika and Freya all the best! Thanks Derek! I hope you and Nicky are loving life! Thank you Clare! Hopefully there weren’t too many typos.